Innovative initiatives and projects include government-wide green procurement of electronics and paper products, food waste recycling in public sector premises and a floating solar test-bed in Tengeh Reservoir. Deputy Prime Minister and Minister in Charge of the Public Service, Teo Chee Hean, launched the inaugural Public Sector Sustainability Plan 2017-2020 (PSSP) at the opening ceremony of the Singapore Sustainability Academy1 on World Environment Day. The public sector in Singapore comprises 16 ministries and 64 statutory boards. It is the largest employer in Singapore with about 145,000 public officers, operates around 1,000 facilities and is hence a significant consumer of Singapore’s limited natural resources. It is taking the lead to contribute to the nationwide Sustainable Singapore Movement, and the goals articulated in the Sustainable Singapore Blueprint. The PSSP outlines the public sector’s collective efforts to go green. Innovative initiatives and projects include government-wide green procurement of electronics and paper products, food waste recycling in public sector premises and a floating solar test-bed in Tengeh Reservoir. Singapore is installing a first-of-its-kind floating solar photovoltaic cell test-bed located in Tengeh Reservoir, costing S$11 million and covering three hectares. A joint project between Economic Development Board (EDB), PUB, and the National University of Singapore’s Solar Energy Research Institute of Singapore (SERIS), the pilot can produce up to 3.3 GWh of electricity each year, enough to power 750 Housing & Development Board (HDB) households for a year. If proven to be economically viable and environmentally sustainable, wider deployment to more water bodies in Singapore will be considered. Another innovative project is SolarNova. Led by the EDB and HDB, SolarNova promotes and aggregates solar demand across agencies, with the aim of deploying solar panels on Singapore’s many roof spaces, from public housing estates to public sector buildings. 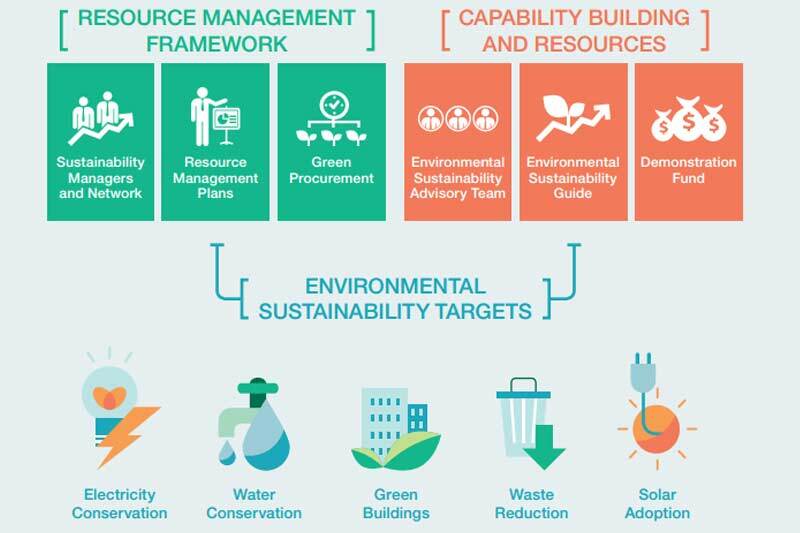 There are four main components under the framework guiding the PSSP- Resource Management Framework, Capability Building and Resources, Sustainability Targets, and Transparency and Disclosure. All ministries and organs of state have appointed Sustainability Managers (SM), who work with the Facility Managers (FM) of each agency to drive environmental sustainability efforts within their organisations. As of March 2017, 162 SMs and FMs have attended Green Mark facility management training courses to develop their technical capabilities. Best practices are shared among the agencies through a SM network. All ministries and organs of state have developed individual Resource Management Plans (RMPs). The RMPs document the plans and progress for resource conservation, green building certification, waste reduction, and solar adoption. The RMPs are reviewed and updated every year. The SMs are responsible for the timely implementation of the measures in their RMPs. Since 2015, all agencies are required to purchase only paper products certified with the Singapore Green Label by the Singapore Environment Council (SEC), as well as electrical appliances certified with high energy efficiency, such as refrigerators, televisions, air-conditioners, and lamps. Since 2009, the public sector only sources for Information and Communications Technology (ICT) equipment which are Energy Star certified. The Government has aggregated demand across agencies wherever possible to achieve economies of scale. Green sourcing requirements have been included in the Government’s procurement contracts. The Environmental Sustainability Advisory (ESA) team, comprising officers from the Ministry of the Environment and Water Resources (MEWR), the National Environment Agency (NEA), the Public Utilities Board (PUB) and the BCA, provides in-house technical expertise to support SMs in their work. The team. An Environmental Sustainability Guide containing a repository of best practices, as well as recommended measures for resource efficiency, has been published to assist agencies. A Demonstration Fund has been set up to pilot innovative solutions for environmental sustainability within the public sector. Ongoing pilots include two food waste digester projects at Republic Polytechnic and Pioneer Junior College (PJC) to convert food waste to grey water or compost. These digesters can recycle at least 26 tonnes of food waste annually. In FY2016, the integrated Energy Management System (iEMS) pilot was launched in selected large public sector buildings to monitor energy consumption and identify opportunities for energy use optimisation. These pilot solutions will be rolled out to more public sector buildings if successful. The public sector has also set targets to reduce electricity and water consumption by 15% and 5% respectively by 2020 from FY13 levels and it is on track to achieve these two targets. Agencies have already committed electricity saving measures that will collectively lead to 15.2% electricity savings by FY2020. These include “hardware” improvements, such as replacing or upgrading air-conditioning systems and lightings, and “software” actions, like promoting organisational habits that minimise electricity consumption. The agencies have also committed to water-saving measures that will collectively lead to a 5.1% improvement in WEI by FY2020. This translates to about 900,000 m3 of water savings a year. Measures include installing water efficient fittings in buildings, efficient irrigation systems, and private water metering for leak detection; replacing inefficient cooling towers; and recovering and reusing AHU condensate water. 1The Singapore Sustainability Academy is a joint collaboration between City Developments Limited (CDL) and the Sustainability Energy Association of Singapore (SEAS). It is the first major People, Public and Private (3P) ground-up initiative in support of the UN Sustainable Development Goals and Singapore’s national goals to tackle climate change.